All Products > "53696 Tamiya Super Stock Motor Type TZ"
• A high performance motor for electric radio control car use. 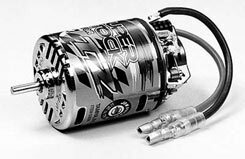 • A high torque motor designed for endurance race or low speed track. • Can be disassembled for maintenance. • Blue anodized end bell with brush dampers. • Features terminal heat sink and detachable chip capacitor.